Whether it’s a top-performing tomato or a particularly fragrant flower, seed saving is an easy and fun way to share seeds, continue a planting tradition, or keep alive a favorite variety for years, says C.L. Fornari, an Osterville, Mass., garden speaker and consultant. Before saving seeds, gardeners should first be aware that most prepackaged seeds sold in stores are hybrids, Fornari says. “If the plant is a hybrid, we’re not going to get the same plant if we save those seeds,” she says. When a flower has fully wilted and the seeds have started to darken, it’s time to start saving the seeds. This will typically be right before the pod will fall from the plantnaturally, she says. For vegetables with seeds inside the produce, such as peppers, wait until the vegetable is overripe. “You’d leave it on long past the time you’d pick it and eat it,” Fornari says. “If they’re dry, they’re not going to stick to the paper towel,” Fornari says. If you still aren’t sure the seeds are dry, put them in an envelope and set it aside. 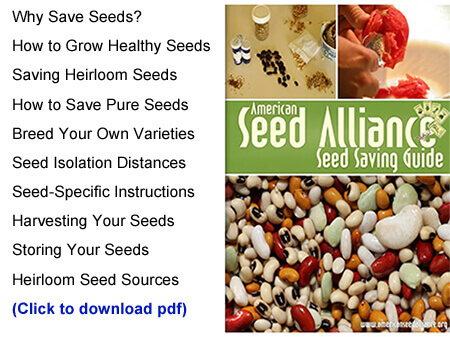 Whether you’ve saved your own heirloom seeds for generations or generally just rely on whatever you can find on the nursery rack each spring, the American Seed Alliance’s Seed Saving Guide has a wealth of useful information for any gardener.